Background text prepared for Learning Sites by Dr. Timothy Kendall (in 2001, then Research Scientist, Dept. of African-American Studies, Northeastern Univ. ), Director of the Joint Mission of Northeastern University, Boston, and the Sudan National Corp. for Antiquities and Museums (NCAM), and currently (2016) Director of the Qatar-Sudan Archaeological Project. Despite the limited time spent in the Wadi Muqaddam (northern Sudan; see map at ther left; hover over to enlarge) during 1999 and 2000, we were able to familiarize ourselves with a large geographical area of the Sudan about which very little was previously known archaeologically. Our data, still very imperfect and incomplete, are nevertheless presented here as a foundation on which we and others can build and can serve as a basic guide to the survey area. No doubt many of the opinions expressed here will have to be refined or changed altogether as work continues, but one thing is certain: that exploring closely the great wadis of the Bayuda is work of great profit. This is what we have learned thus far: The Wadi Muqaddam is a complex culture area of great antiquity. It is densely marked with ancient tumulus graves and cemeteries, which are generally the only monuments remaining visible because they were built with stone. The corresponding settlements were built with mud brick or even more fragile materials and thus, except in the most exceptional cases, they have become invisible from the surface. The tumuli are not all of the same type and perhaps suggest chronological or cultural differences that can only be determined through excavation. Many of the graves are isolated and perched on high promontories; others cluster in small groups. Some of the cemeteries consist of large tumuli surrounded by dozens or hundreds of other smaller graves hardly visible on the surface. These larger cemeteries would seem to reveal the locations both of the most important ancient settlements in the wadi and the sites of the best ancient water sources. The distance between these cemeteries/sites reveals that they are spaced from one half to one day's foot journey from each other and must have been the main stops or watering stations for ancient traffic traversing the Wadi Muqaddam. We found that at Al-Meragh, a number of tumuli are built directly on top of an earlier Meroitic townsite. This suggests that perhaps some of the other ancient townsites in the wadi may lie directly beneath later cemeteries. We further discovered that nearly all the larger ancient cemeteries are also very close to the sites of modern wells. At every one of these wells the local people repeated the same story: namely that the wells are really ancient wells, which their grandfathers discovered filled with sand less than a century ago, dug out, and put back into service. The wells, therefore, would seem to contemporary with the cemeteries and may be even earlier. The site of Al-Meragh is located 227 km north of Omdurman and about 66 km south of Korti (see the map above). The townsite at Al-Meragh reveals that the central Bayuda was at one time occupied by the Meroitic state. The buildings discovered there thus far all seem to be private houses, but the largest are also of a plan and construction that suggests they were built not by their occupants but by the state itself. The houses are duplex units of identical plan, and their stone columns and doorways suggest that they were to be used by high-status individuals, probably the officials sent by the state to live there as its governing representatives. The town appears to have been occupied for no more than one or two generations before it was destroyed by fire, which appears to have been the work of an enemy. The Napatan texts suggest that this enemy was the people called the Meded, who were said to live in the area "west" of Krtn. Krtn is almost certainly the ancient name of Korti, which lies on the left bank of the Nile at the terminus of the Wadi Muqaddam. Between 15 and 18 km up the wadi from Korti is the largest ancient cemetery in our survey area, which suggests the location of a huge settlement of long duration. One can only assume that this place, which we call tentatively Gireid-Fuweika, was the primary seat of the Meded, from which these people may have traditionally controlled the Wadi Muqaddam, when it was not in the hands of the Meroites. Al-Meragh lies about 50 km further south. 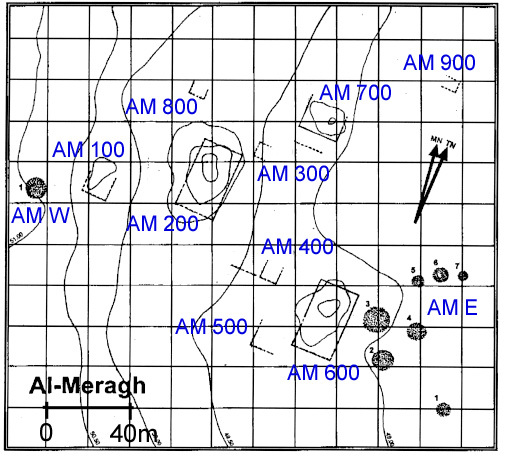 Al-Meragh was clearly a large and prosperous Kushite outpost sometime during the Meroitic period. Since all the buildings yet found have similar orientation (see the site plan above), the town has the appearance of having been planned and laid out almost as a single conception and built relatively quickly. It also appears to have had only one occupation period, with a duration seemingly (at this point) no more than one or two generations. The most important structures on the site appear to be those utilizing stone, but of course these are only the ones that remain visible on the surface today. Other equally large or important structures may yet be found that used very little stone or none at all. In any case, all the large buildings so far investigated seem to be luxurious private houses. No temples have yet been identified (although these are anticipated), and we have not yet found any cemeteries contemporary with the site, although they must be close by. The large private houses of Al-Meragh are curious because, at least in the case of AM 200 and 600, they conform to the same plan (see the plan of AM 600 above; for more information about that house and its digital reconstruction, see the menu at the top of the page), each of which incorporates two spacious, symmetrical housing units for high-status individuals. In other words, this plan was used twice on the site to create four identical luxury residences in close proximity. The visible plan of AM 700 suggests still another house or duplex of closely related form and identical size. These houses, together with their incorporation of finely made stone columns and doorways, give the impression of being built and financed not by their occupants but by a public authority. In fact one would have to conclude from this evidence that the houses were constructed by the Meroitic state to provide comfortable living quarters for the high officials it sent to work there. The very existence of a Meroitic town site in this remote place poses a number of questions. If it was a government installation on the Wadi Muqaddam, it surely cannot have existed here in isolation. We have to assume therefore that between it and the Nile, probably both north and south, there were other closely linked Meroitic settlements, caravan stops, herding stations and police garrisons, and that none of these was more than a day's journey from the other. With the exception of some Meroitic surface remains reported south of Tamtam by the survey team of the Sudan Archaeological Research Society, London (SARS) in 1997, no other evidence for Meroitic presence here has yet been identified. If Al-Meragh was indeed a Meroitic administrative center, can we even assume it was the most important in the Wadi Muqaddam? Whether or not it was, we must surely wonder why this location was chosen for such a settlement, since today this place is one of the most desolate spots on the northern leg of the wadi. The area, furthermore, seems to be quite exposed and offers little in the way of defense. We can only suppose that two millennia ago, it was a uniquely fertile place and possessed of an especially good water supply. Although the Wadi Muqaddam now seems a forbidding place, occasional drenching rains in late summer (July-September) bring water in most years. This allows the present nomad population to plant one or even two crops in the fall months in the wadi basin, where standing water can remain even as late as November. During the dry season (November to July), the land reverts to desert, and the people maintain a marginal living raising camels, sheep and goats, and have few other requirements for survival than walking to the local wells several times a week, watering their livestock, and replenishing their own water supply. The only vegetation in the wadi today consists primarily of stunted, gnarled acacia trees, various bush-like plants or pygmy trees, and limited areas of dried grasses. From the finds at Al-Meragh, one realizes very quickly that weather conditions here 2000 years ago must have been considerably better than the climate situation today. At present there is no water available in the district other than from the well of Al-Meragh, 2 1/2 km distant from the site. The great size and number of the mud brick buildings in evidence here reveals that ample water was once available for brick-making on a large scale, at least during the wet season. 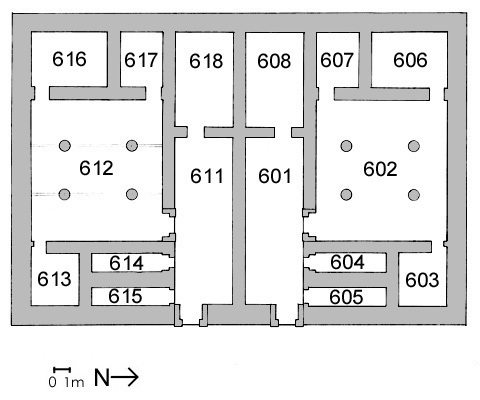 We should also take note of the wide spacing (3.9 m) between the columns in buildings AM 200, 600 and 700 (see the plan of AM 600 at the left; hover over to enlarge). This reveals the size of the main rafters that must have been used in the ceilings and hence the size of the trees that once grew in the area. There are no straight trees of that size anywhere in the wadi today, but two millennia ago there must have been many stands of palms, revealing that the land around Al-Meragh must have been much more fertile than it is now. The widespread existence of palms in the Bayuda, even in relatively recent centuries, is revealed by the Arabic name of the great wadi to the northeast: the Wadi Abu Dom ("Father of the Dom Palm"), where, except at Ghazali, no palms survive today. We also found cattle teeth in abundance in the excavations, suggesting that cattle were doubtless a mainstay of the local economy. Today cattle are rarely seen in the Bayuda, and along the Wadi Muqaddam there are none due to lack of pasturage. The obvious affluence of Al-Meragh's chief residents suggests that the Meroitic state, at least at one time, colonized and ruled this region and perhaps established control over the entire length of the Wadi Muqaddam. Based on the foregoing observations, we can imagine that, at least in certain areas, the wadi was probably quite productive and supported large numbers of cattle. The primary interest of the Meroitic ruler on the one hand may have been to open and develop the wadi road for trade and to ensure its security. On the other hand, he (or she) may have had an equal interest in dominating, policing, and taxing the fiercely independent local population, which, as we gather from the late Napatan royal inscriptions, had a great wealth in livestock but little inclination ever to recognize Meroitic authority. These people had their own rulers, periodically erupted from the desert and raided the riverain villages, and were a constant threat to Meroitic regional stability and security. It may be assumed that Al-Meragh was built during a time of short-lived Meroitic hegemony over the Wadi Muqaddam. Excavations all over the site show that the town was burned, almost certainly in a single episode, that it was left to ruin, and that it was never reoccupied except later, perhaps centuries later, by the tumulus builders. The fire was surely deliberate, since we found the same pattern of damage in contexts up to 100 m apart. Buildings of this type are not flammable from the outside, so a natural spreading of the fire from one building to the next seems out of the question. Such houses can only be set on fire if their flammable roofing materials catch fire. Since the roofs are covered on the outside by mud brick, it is only on the inside of the rooms that the flammable beams and ceilings were exposed. It is thus only from the inside that the houses could have caught fire. We can only conclude, therefore, that the town was attacked by an enemy force, which entered all the houses, probably after looting them, and then set them on fire from within. If these conclusions are correct, we may wonder about the identity of the tumulus builders. Who were they and what relation, if any, did they have to the Meroitic town or its inhabitants? How much time separated them from the Meroitic occupation? Why did these later inhabitants of Al-Meragh build their graves directly beside and over the ruined Meroitic buildings, which must still have been conspicuous when the tumuli were built? Did they venerate the memory of this place, or the vanished inhabitants, or certain individuals, or the deities presumably worshiped here? Or did they have any memory or tradition of them at all? Did they identify the site as important for reasons other than the Meroitic settlement? Further excavation may show the relationship of the earlier and later peoples, or a continuity of the site, but for now we have little to go on. Who were the destroyers? Our only historical information about the ancient Bayuda derives from several Napatan royal texts, which strongly suggest that it was not quite the harsh desert it is today, at least along the great wadis. Probably along the Wadi Abu Dom, the Wadi Muqaddam, and the Wadi el-Melik, the Bayuda during late Napatan and in Meroitic times was inhabited by predominantly sedentary peoples, living in small villages and raising large numbers of cattle, sheep and goats and owning slaves. These peoples were apparently governed at the local level by chiefs, and on the regional level by supreme chiefs or "kings," who may, somewhere, have had their "capitals" and "palaces," given the occasional mention in these texts of desert rulers having much wealth in gold. Although the Napatan inscriptions may be somewhat earlier than the period of Al-Meragh, the situation they describe provides a context for understanding the ethnic, social and political processes at work in the Bayuda probably throughout Meroitic times. The Wadi Muqaddam intersects the Nile at the modern town of Korti on the right bank of the Nile. The Sudanese recognize that the name "Korti" has no Arabic derivation, nor do they have any idea of its origin. They call the modern inhabitants of the town "Koarta." For a long time scholars have equated the place name Krtn/K3rtn of the Napatan texts with Korti, since the ancient town was said to be "downstream from Napata," just as modern Korti is 55 km downstream from Karima (the site of ancient Napata). In the Greco-Roman toponym lists of the Middle Nile, the name apparently continued variously as Cadetum, Cadata, or Coetum, which was also placed just downstream from "Nabatta." The clearest indication of the correctness of the association Krtn=Korti derives from the Year 1-2 Kawa Stele of Irike-Amanote (c. 430-400 BCE). In this text, the king states that he departed Napata soon after his coronation and tarried at Krtn, where he had a palace. On the eighth day after his arrival there, at dawn, the town was attacked by the "western desert dwellers called Meded (Mdd)," who fled when they saw that the king was there. The king's soldiers gave chase and made a great slaughter among them, without the Meroites losing a single man. Because of the apparent phonetic relationship between the ancient tribal name "Mdd" and that of the modern "Beja" of the eastern Sudan, scholars have generally preferred to place the Mdd on the east bank of the Nile in the Nubian Desert. They have thus assumed that the action referred to in the text occurred "opposite Korti" on the right bank, rather than at Korti itself, which is on the left bank. The text states, however, that the Mdd were "western desert dwellers" who attacked the town. If the Mdd really lived in the Nubian Desert, as proposed, it is highly unlikely that they would have been designated "westerners," since immediately around the bend of the river they would have to be called "easterners." Far more likely is it that Krtn and Korti are the same place, on the left or "west" bank of the Nile (here actually the "south"), and that the Mdd, who attacked the town, were inhabitants of the Wadi Muqaddam. In the stele of Harsiotef (c. 390-350 BCE), the king records that in his third regnal year he "fought with the rebels of Meded-land and slaughtered it." Again in his fifth year, he sent his infantry and cavalry "against the rebels of Meded-land," but here he adds some fascinating details. He claims to have raided three towns of the (district called) Anruare and "(made) a great slaughter of it." The Kushites even took prisoner its lord, named Saweri-raga..ta, and killed him. The following year, Harsiotef "called to many (to march) against Meded-land", again fighting in one of the towns of the Meded and making "a great slaughter." There he "took captive its long-horned oxen, its short horned cattle, its donkeys, its sheep, its goats, and its male slaves and female slaves." The supreme chief of the Meded then sent to the king saying, "You are my god; I am your servant. I am a woman. Come to me." He then had his deputy delivered over to the king so that Harsiotef might withdraw. It is interesting that for the remaining thirty years of Harsiotef's reign there is not another mention of hostilities with the Meded, as though those people had reached some sort of accord with Meroe that lasted for a generation or more. Perhaps they even grudgingly submitted to Meroitic authority. Some time later, in Meroitic times, it may have been just such an episode that allowed Meroe to occupy the Wadi Muqaddam and to construct towns like Al-Meragh. The last great royal historical document written in Egyptian is that of Nastasen (c. 335-315 BCE), who enumerates many victories over various peoples on his frontiers. Most of these peoples are identified by very specific names, perhaps district or tribal section names, which are not otherwise known. What is interesting to note, though, is the enormous wealth in cattle the Kushite king claims to have captured from them. Typical among these entries is the following: "I had the bowmen go against the rebels of Rebala and Akulakuro. I caused a great slaughter. I seized its chief Luboden, all his property in abundant gold, beyond reckoning, long-horned oxen: 203,216 (head), livestock: 603, 107 (head), all the women, and all that with which a person is kept alive.I gave him, (this) chief, to Amun of Napata, my good father." The huge numbers of animals listed seem to be inconceivable, but we certainly understand that a large quantity was intended. One gets the feeling that Nastasen may not actually have taken these animals captive; he may simply have taken over the lands of these people, counted up the livestock, property, and residents, and considered all of them his own. The large store of gold, "beyond reckoning," of the ruler makes us wonder what form it took, whether raw or worked. Such comments, in any case, suggest that the regional desert chieftains were not necessarily culturally or materially impoverished. Whether any of these entries refers to the people of the Wadi Muqaddam, we cannot know, but as the wadi was one of the more fertile areas on the Meroitic periphery, we must assume that it was heavily populated and prosperous (a fact confirmed by our archaeological survey) and that it played a central historical role. Later in Nastasen's text, a people called the Mdyy are said to have raided the temple of Kawa and to have stolen the treasures donated to it centuries earlier by Aspelta. Because Kawa lies on the east bank of the Nile, about 200 km downstream from Korti, it has generally been assumed that the name Mdyy and Mdd referred to the same people, and that, like the modern Beja, they lived on the east bank of the Nile. Tempting as the equation Mdd=Mdyy=Beja seems, we cannot rule out other possibilities, namely: (a) that the name "Mdd" in its variants was a generic or ethnic term, applied by the Meroites to peoples living on both sides of the Nile; (b) that the names Mdd and Mdyy referred to two different peoples; (c) that the name Beja originally derived from people living on the west bank; (d) the name Beja did not derive from the ancient names Mdd/Mdyy; or (e) that the Mdd/Mdyy of the western desert were not averse to staging cross-river raids when the prize was rich enough. As described above, our survey of the Wadi Muqaddam just south of Korti has revealed the site of an enormous, completely unknown ancient settlement. Based on the textual evidence reviewed above, it would seem to be a very strong candidate for identification as the capital of the Meded nation. One would assume that the Meded raided Krtn and other Meroitic river towns probably only during the dry season, when they would have been desperately seeking fodder for their livestock. In the Irike-Amanote text, the Meded raid occurred in the "first month of the Inundation", about two weeks after the start of the New Year in mid-July. This time, just before the commencement of the summer rains, is precisely when the herdsmen of the desert would have been under greatest stress due to shortage of water and fodder for their animals. The same situation holds true for the modern nomads. Our initial estimate for the date of the site is ca. 350-100 BCE. It might just date to the tail end of the Napatan Period, possibly even to the reign of King Harsiotef (mid-fourth century BCE), when the desert tribes seem to have been temporarily quelled, according to his stele (now in Cairo).